Make a well in the centre of the flour and add the salt and sugar. Then scatter the butter in small pieces over the flour and rub in with your fingertips. Dissolve the yeast in the warm milk and add the olive oil. Mix in the dough. Then knead into a smooth paste and shape into a ball. Finally make incisions with a knife and sprinkle with flour. Chop onions then heat in a pan and fry until they are soft. Cut the ham into cubes and cook on a low heat for a couple of minutes. Season with oregano, salt and pepper. Then remove from the heat and allow to cool down. Meanwhile skin and slice your tomatoes. Then rinse the anchovy fillets and set aside the olives. Cut the yeast dough into quarters. 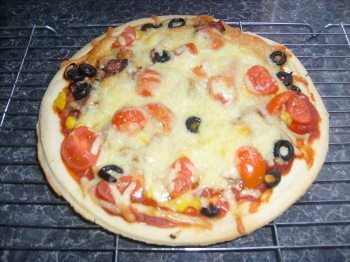 Then roll out on a flour covered work surface and use to line 4 greased pizza ot flat tins. Spread the tomato puree over the rolled out dough. then cover with the ham and onions. Also te tomato slices, anchovy fillets and olives. Slice the mozzarella cheese and cover the pizza. Bake in a pre heated oven at 200 celsius (400 Farenheit) Gas mark 6 for 20 minutes. Sprinkle with parsley to dress them serve. These are absolutely delicious and kids just love them.